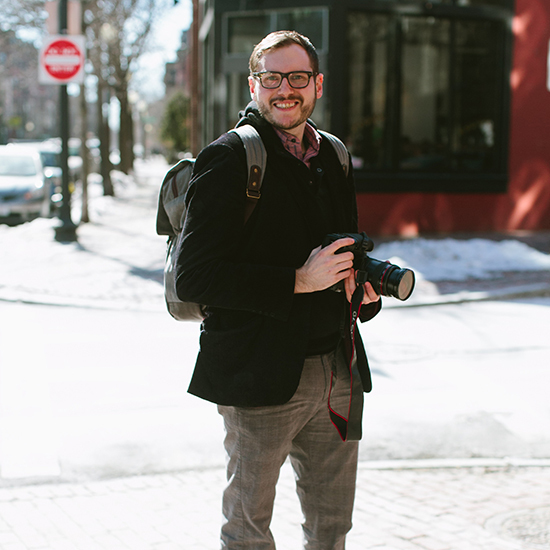 Brian Samuels of A Thought For Food talks about how he went from amateur to pro photographer. Hint: It involved lots and lots of practice. The Blog: Boston-based photographer Brian Samuels, who shoots for clients such as KitchenSurfing, experiments with recipes and food photography at A Thought for Food. A pescatarian, his favorite dish on his site is a spicy squid and mango salad. "I could eat it every day and never get tired of it. It’s full of bold flavors and, at the same time, it's incredibly refreshing," he says. How did you learn or teach yourself photography and food photography in particular? It's definitely a combination of the two. I studied film production at Emerson College and left school with a great foundation. But I hadn't spent much time doing still photography and never really thought that this would be something I'd do professionally. When I created A Thought For Food in 2009, I did'’t even have a DSLR. I learned how to make do with what I had (a point-and-shoot camera), working with light and angles to make the dishes look as appealing as possible. And when I felt ready, I upgraded. I would never say that I'm self-taught, because my college education was invaluable. With that being said, I really didn't have any experience with photographing food and had to teach myself ways to light, style and frame it. And the technology was so different from what I was used to. Of course, I'm still learning. Every project I work on teaches me something new. Do you treat shooting for the blog any differently from shooting for an assignment? I treat the two very differently, but at the same time I approach both with the same level of professionalism. With my blog, I have the freedom to create images that represent my mood and my connection to a recipe. With assignments, I'm going to work closely with a client to make sure I capture their vision. At the same time, I often discuss my style with them (and they've viewed my portfolio), so they have a sense of the direction I'll go in. What are some of the most challenging foods for you to photograph? Any tips you've learned to make those shots better? Stews and soups are often challenging. Casseroles, too. You have to get creative with these shots. The easiest way to make them more photogenic is by adding some color or other texture into the shot. This can be a garnish or it can be an interesting bowl or platter. Before I even take out the camera, I conceptualize the shot. My goal is to give a dish some life...sometimes it's by making the image brighter, but sometimes it's also bringing out the natural beauty and character of a dish. Most of the time, the way to do that is by digging into it. Take a bite, a scoop, a slice...and the results may surprise you. What are some of your favorite Boston area restaurants right now? This is a very exciting time for the food scene in Boston, with lots of restaurants opening or expanding. My current favorite is Alden & Harlow, in Harvard Square. I'm never disappointed by their food or drinks, and their service is fantastic. I'm also quite fond of Row 34, in Fort Point. They do a seafood charcuterie board that makes me a very happy guy. And I have to give a shout-out to Tenoch Mexican, which makes my favorite fish tacos in the city. What food-related blogs are you most excited about right now? This is the hardest question to answer because I could probably give you a list of 50-plus blogs that I love for a variety of reasons. But if I have to write down only a handful, I'd say The First Mess, The Vanilla Bean Blog and Indian Simmer are a constant source of inspiration. They do a great job of creating a mood on their sites and their recipes are in line with the food I like to eat.